Shortlisted for the best children’s book of 2017 by Publishing NexT. nominated in the children's book category for the Valley of Words Award. "Imagine Jenga, a block-stacking-crashing offline game. One wrong move and the entire towering block that you carefully constructed can tumble down. Nature is like Jenga – our water, our air, our land, and even we are all connected to the climate. As you may have observed, usually the earth knows how to regulate her own climate (she’s quite smart, oh yes, she’s a woman). But the amount of GHGs we are deliriously pumping into the atmosphere is beyond the earth’s regulation capacity." Media coverage: Read Huffington Post's story on So You Want to Know About the Environment here. "Human beings used to be hunter-gatherers. Small groups hunted for animals in the wild. They also gathered edible roots, nuts, berries (can you imagine, the kind of trial and error that had happened here? *Grunt*… do you think that mushroom’s tasting a bit off, Oops! Thunk! )....And now? In the twenty-first century, we are growing more food but not feeding our entire planet. We are forcing animals into battery cages, dingy pens and crowded, unlit barns. Indiscriminate use of pesticides and chemical fertilizers is harming the soil, making it less fertile and, thus, reducing yields. Food is processed until it’s almost unrecognisable; or, frozen or treated with processes so that it can be eaten even when it’s not being grown seasonally...."
Media coverage: Read an Excerpt from the Book in Pune Mirror and Daily O. "Imagine being a gorilla in East Congo. Go on, think you’re 4 to 6 feet tall if you were to stand up, weigh some 150 to 200 kilos and have an endangered status. You’re smart, you have great tracts of forest land to chill in, you can climb trees like, well, a monkey. 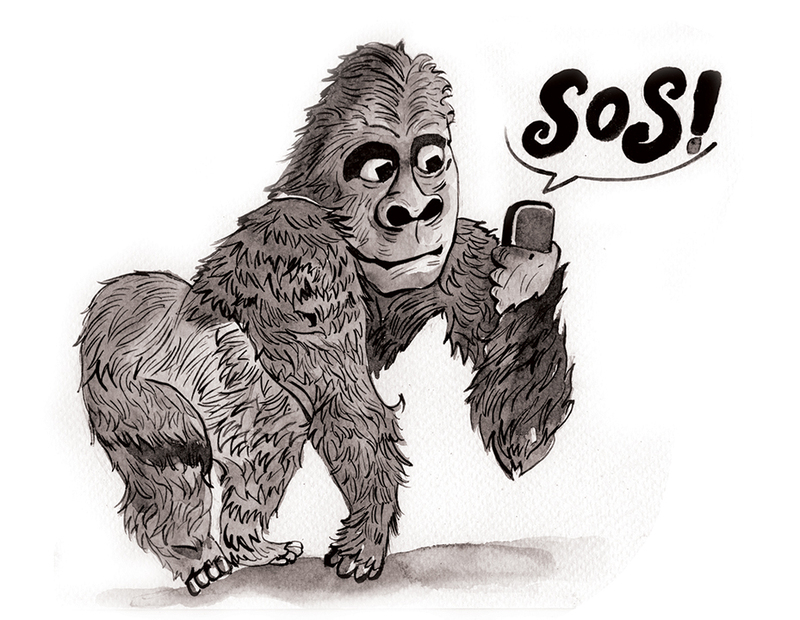 As a gorilla, you don’t use smart phones. You have better things to do with your time, such as pounding your chest, munching on fruits, and mostly chilling about. Yet you and your family are losing your home because of that gadget."